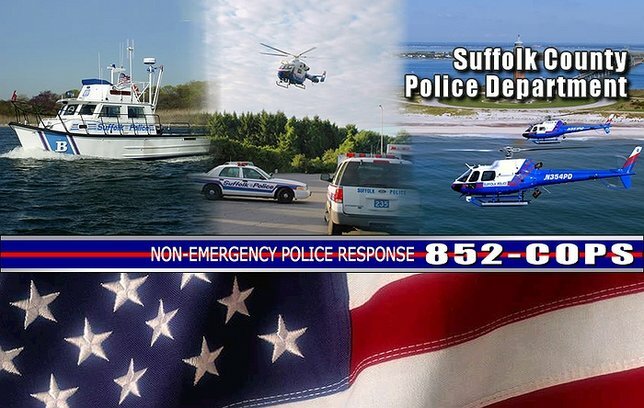 Suffolk County Police Sixth Precinct officers rescued a man whose kayak sank and left him swimming in the Long Island Sound last night. The man was located swimming approximately 100 feet from shore. Suffolk County, NY - July 30, 2016 - Suffolk County Police Sixth Precinct officers rescued a man whose kayak sank and left him swimming in the Long Island Sound last night. At approximately 10:15 p.m., police received a 911 call reporting a possible stranded boater calling for help in the Long Island Sound to the right of the Lighthouse at the end of Old Field Road. Officers John Roy and Matthew Merced responded, made their way to the water’s edge and could hear a man calling for help. Suffolk County Aviation Section responded and was able to illuminate the area. The officers directed the helicopter towards the cries for help and located the subject. The man was located swimming approximately 100 feet from shore. Marine Bureau units also responded but were unable to approach the swimmer’s location due to the rocky conditions. Officer Roy removed his gear and vest and entered the water. He made his way to the kayaker, placed him in a lifeguard rescue hold and swam back to shore. Officer Merced followed Officer Roy and assisted the pair back to shore. The victim was able to walk away from the water unassisted. He was evaluated by Setauket Fire Department medical personnel and did not require further medical attention. The victim reported he had gone night fishing in his kayak and while he was out on the water his kayak began taking on water and eventually sank. He did not have a personal flotation device nor did he have his cell phone with him. Subject: LongIsland.com - Your Name sent you Article details of "Man's Kayak Sinks, Left Swimming in the Long Island Sound Until Being Rescued By Officers"